When we look at longer cycles we should remember that most of the downside occurs within the last 1/8th or so of the cycle. For example: if it were a Wall cycle (~~4 1/2 months) we would expect the most damage within the last month of the cycle. Or, 1/3 of a Kitchin Cycle (~~13 1/2 months) would have the most down side action with the last 2 months of the cycle. We are entering the period where we should start seeing that down side pressure from the 1/3 Kitchin cycle early in November and the down side pressure from the Wall Cycle by the end of November. Additionally we have the interplay of the shorter cycles (which I will try to cover weekly) as these longer cycles start giving us market weakness strengthening throughout November and reaching a point of maximum downside by year end. Hurst cycles which I watch - previous 18 month cycles peaked at week 59/53/51 in the last 20 week cycle and a correction for 10/12/9 weeks has followed... now we are at week 50 of the 18 month cycle and it is time the indexes to move lower for the next 2 months. 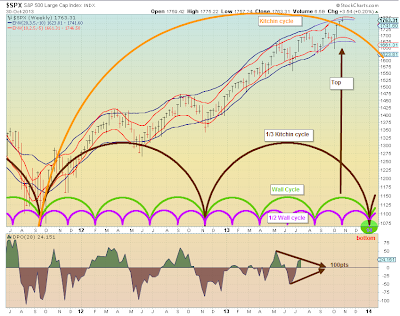 Nice chart, we seem to align on the 20 week cycle (4 1/2 month or I refer to it as the Wall cycle). 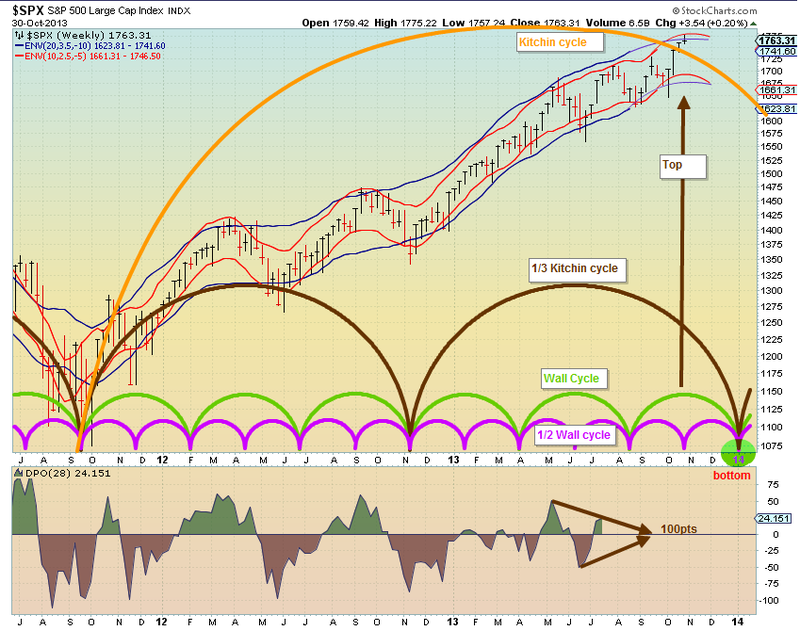 The 40 week (9 month) cycle is 2 X Wall cycles. So there appears to be a lot of similarity between my analysis and your Hurst chart.